Marantz launches Melody X all-in-one hi-fi system | What Hi-Fi? When space is limited, there's a lot to be said for all-in-one systems like the new Marantz Melody X. Also known as the M-CR612, this box of sonic tricks squeezes in CD player, music streamer, DAB/FM radio plus voice control and multi-room smarts, courtesy of its built-in Heos technology. The M-CR612 has four channels of amplification meaning you can drive two different pairs of speakers in different rooms and adjust their volume independently. Alternatively, you can bi-amp or double the output power to one pair using the system's PBTL Mode. Partner the Melody X with the Heos app for iOS and Android and you can access a number of streaming services, including Spotify, Tidal and Deezer. Using the app, you can also use it as part of a multi-room system by combining it with other Heos-compatible products from Marantz (and Denon). You can also use Amazon Alexa, Google Assistant and Apple Siri virtual assistants to to control the system through their respective apps. There's high-res audio support up to and including 24-bit/192kHz and double DSD (5.6MHz). Alternatively you can go wireless with Bluetooth and Apple AirPlay 2. 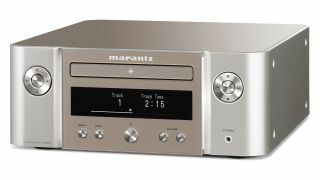 The Marantz Melody X M-CR612 launches on April 15th and will be available in black or silver-gold for £629.